Ruijie RG-AP120-W Wall AP is a wireless access point designed for high-speed wireless LAN. The RG-AP120-W Wall AP adopts 802.11n standards and supports both FAT and FIT AP modes, which is ideal for dense wireless deployment in hotels, office towers, residential buildings and settings alike. The wall-mountable AP has the same size as a standard 86-type faceplate with integrated Ethernet and voice ports. 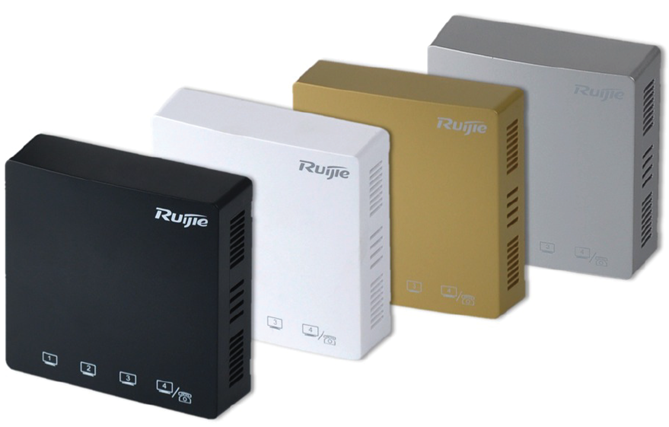 The Ruijie RG-AP120-W Wall AP with concise design and easy deployment can be easily installed with zero disruption to the interior finishes, offering the best choice for network deployment in places with delicate interior design such as hotels and office towers. The RG-AP120-W Wall AP delivers data rates of up to 300Mbps per AP and adopts the 802.11a/b/g/n standards. The Wall AP provides 4 x RJ-45 FE LAN ports and an RJ-11 port (combo), delivering excellent availability and flexibility.